AIDE Abroad is a nonprofit organization with a background of over 19 years of experience operating international exchange programs that have impacted the lives of more than 5,000 people. AIDE Abroad offers a wide range of internship, volunteer, teach or work programs. In China AIDE Abroad offers internships and teaching opportunities. AIDE Abroad’s Teach China program places you in a paid English teaching position in a Chinese school for either 1 or 2 semesters. The majority of our positions are with language schools, and some positions will allow you to work with younger children. Placements are available in a wide variety of rural and urban locations throughout China. As an English teacher, your responsibilities will include preparing lesson plans, conducting English classes, grading students’ homework, and participating in students’ extra-curricular activities. You will be placed based on your background, qualifications and availability. AIDE Abroad gives you the opportunity to not only travel to a new country, but but to gain real life experience in your chosen destination. Our Intern Abroad programs are the perfect way to live like a member of the local community and fully integrate into a new culture. 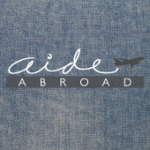 AIDE Abroad offers hospitality, human resources and journalism internships.